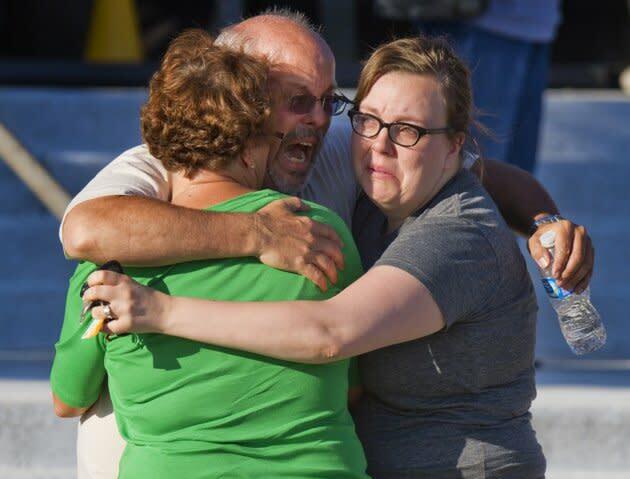 AURORA, Colo.--The gunman who blasted his way through a packed movie house early on Friday, killing 12 people and injuring 58 others, had apparently been planning his attack for weeks. "In the last 60 days, he purchased four guns at local metro gun shops and through the Internet he purchased over 6,000 rounds of ammunition," Aurora Police Chief Daniel Oates said Friday night. The suspect, 24-year-old former medical student James Holmes, had also been stockpiling magazines to carry the gun ammunition. One clip recovered at the scene could hold 100 rounds for his military-style rifle. "As far as we know, it was a pretty rapid pace of fire in that theater," said Chief Oates, noting that all the weapons purchases were legal. Police are trying to learn more about the man's motives but have thus far been unable to access his booby-trapped apartment near the Colorado medical school where he recently withdrew from classes. Investigators have described the apartment as being filled with chemicals, trip wires, jars of ammunition and possible mortar rounds. "It is a very vexing problem how we'll get into that apartment safely," Oates said. "I've personally never seen anything like what the pictures show us." A law enforcement official familiar with the explosives left in the suspect's apartment described them as "pretty sophisticated" improvised explosive devices. "These are not ordinary pipe bombs," said the investigator, who told Yahoo News on the condition his name would not be used. "No doubt it was meant to kill or maim any first responder that went into that apartment." Officials said it could be Saturday or later before they get the suspect's home defused. If not, the investigator told Yahoo News, serious damage to the entire apartment building is a risk. The thermal liquids left behind "could certainly heat up that room pretty quickly," he said. "We're not going to destroy a building." Holmes is being held in the Arapahoe County Jail. Oates said the man has an attorney, but refused to say if the alleged gunman is cooperating. "I won't talk about his admissions," the police chief said. "The most important thing is that there is justice for these victims, and justice will occur in a courtroom." Holmes is scheduled to make his first court appearance at 8:30 a.m. local time on Monday in Aurora. Witnesses have given chilling descriptions of the scene at the movie theater. "He was dressed in head-to-toe armor and looked like he meant business," said Jordan Crofter, who escaped the theater unharmed. "He just walked around like he was having fun. It was just target practice. His goal was to kill as many people as he could." The number of casualties makes the incident one of the largest mass shootings in recent U.S. history. What provoked the madness may not be clear anytime soon. Holmes, a former college honors graduate who moved to Colorado to attend medical school, is not talking to investigators, a law enforcement official briefed on the investigation told The Associated Press. The official spoke on condition of anonymity in discussing the ongoing case. Police also found jars of chemicals in Holmes' booby-trapped Aurora apartment with wires nearby. "This is the act … of a very deranged mind," said Colorado Gov. John Hickenlooper. Oates said hundreds of calls came in starting at 12:39 a.m. MDT on Friday, and officers were on the scene within 60 to 90 seconds. Some 200 officers eventually responded. It is believed that Holmes acted alone, and the FBI said there was no indication of ties to any terrorist groups. The official said Holmes then apparently propped open an exit door in the theater as the movie was playing, donned the protective ballistic gear and opened fire, the AP reported. Oates said officers found an AR-15 assault rifle—the civilian form of the M-16—a Remington 12-guage shotgun and a .40-caliber Glock handgun in the theater and another identical handgun in the car. The gunman set off two devices that released a smoke or an irritant to distract the crowd. "There were bullet (casings) just falling on my head. They were burning my forehead," said Jennifer Seeger, one of the first to spot Holmes as he stormed inside. "I was just a deer in headlights. I didn't know what to do," she said. Then she ducked to the ground as the gunman shot people seated behind her. "Every few seconds it was just boom, boom, boom," Seeger said. "He would reload and shoot and anyone who would try to leave would just get killed." New York City's police commissioner said he was told the gunman had painted his hair red and called himself the Joker—Batman's nemesis—but Aurora police would not confirm that. For a few moments, many moviegoers thought the initial commotion might have been a promotional stunt tied to the film's opening. Quentin Caldwell said they were about 15 minutes into the film when he heard a very distinct "pop, pop, pop, pop." But Caldwell and his wife soon saw injured people and knew they needed to escape. Those who knew Holmes as a youth describe him as a shy, intelligent person raised in California by parents who were active in their well-to-do suburban San Diego neighborhood. He played soccer at Westview High School and ran cross-country before going to college, the AP reported. A University of Colorado-Denver spokeswoman said Holmes enrolled in a Ph.D. program in neuroscience a year ago but was in the process of withdrawing at the time of the shooting. It was the worst mass shooting in the U.S. since the Nov. 5, 2009, attack at Fort Hood, Texas. An Army psychiatrist is awaiting trial for killing 13 soldiers and civilians and wounding more than two dozen others.